When is cleaning coins not like cleaning coins? This sounds like a joke that only archaeological conservators would enjoy, but it’s actually an honest question! The answer is (in this case at least), when those coins are reused in other objects. Before treatment photo of 42-35-370. This necklace comes from Coban, Guatemala. 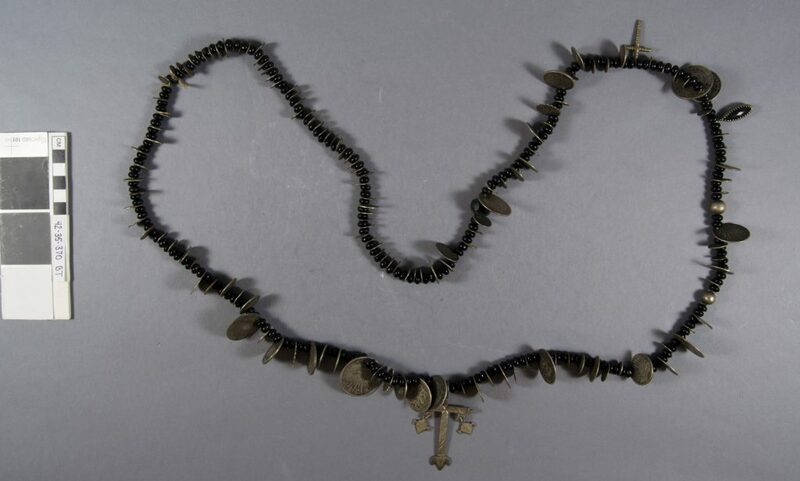 It is made from black glass roundelle beads, interspersed with 144 coins from Guatemala, Mexico, and Spain. It was collected in the early 20th century, but the coins all date to before 1900.
photos of the obverse and reverse of a Guatemalan 50 cent coin, 1870; a Mexican 2 Reales coin (date illegible); and a Spanish 2 Reales coin, 1835. There are also a number of other beads and charms, including two crosses, two round silver beads, and a black faceted stone charm in a silver bezel. The necklace is in good condition, and the only treatment it needs is a nice overall cleaning. Before treatment photo of 42-35-41. 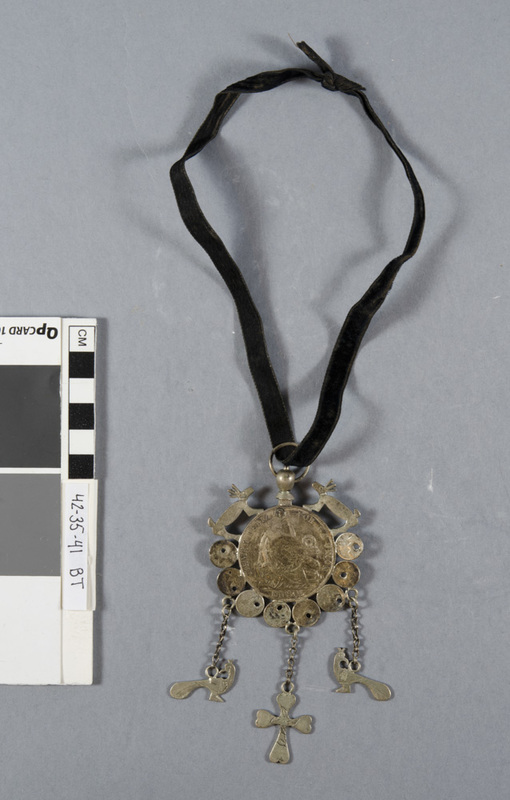 The pendant on this necklace is made from a large 1 Sol coin, dated 1892, surrounded by 8 small 1/4 Real coins, all from Guatemala. On top of the 1 Sol are two small deer, and suspended below are 2 quetzal birds, and a cross. Coins are important in Guatemalan culture. These necklaces would have been symbols of wealth, and be passed down from mother to daughter within a family. Even today, when a couple decides to get married, the groom will often give the bride a gift of 13 coins in a small box, called an arras. Come see these pieces when they go on display in our new gallery! I like to think that even though the Artifact Lab is essentially a fish bowl, when we are in here we are often hiding in plain sight. People in our department have been known to come up to the Artifact Lab to work on treatments because they are less likely to be interrupted up here. That sounds strange, I know, but it’s true. And sometimes our visitors don’t even think that WE are real, so we can kind of operate under the radar even when people are looking right at us. This is not the case all of the time, of course, and we do get plenty of visitors who tap on the glass and try to talk to us even when our backs are turned and we have earbuds in. Aside from the people working in the lab, I think that there are a lot of things that go unnoticed too. 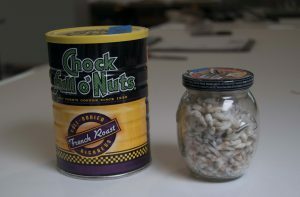 Now, there are some things that people ask about all the time, like, “what is that Chock full o’Nuts can for?” and “what is in that jar?”. Then there are things that go unnoticed but are arguably more fascinating, and puzzling. 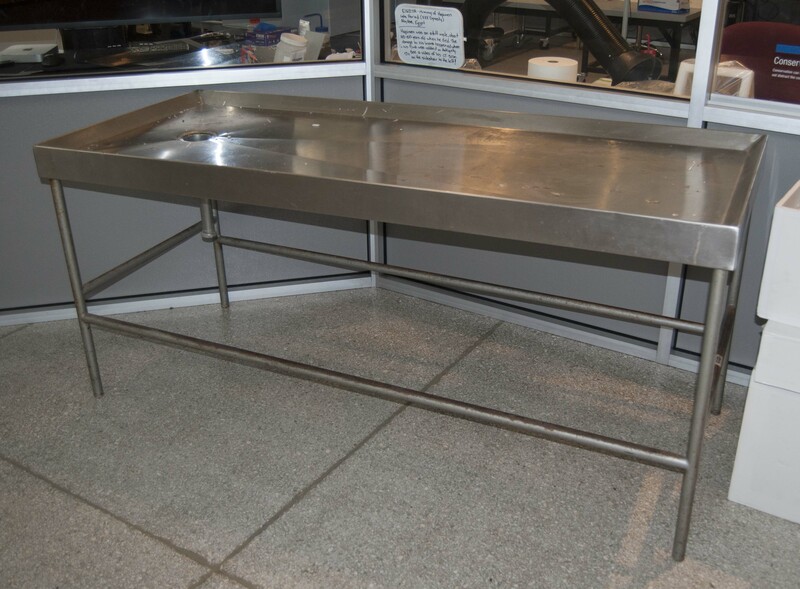 For example, we have never been asked, “why do you have an autopsy table in the lab?”. We probably have never been asked this because I would imagine that most people do not know an autopsy table when they see one. Our department inherited this table many years ago and when we opened the Artifact Lab in 2012 it somehow seemed appropriate to bring it up here (but really, we are NOT autopsying or unwrapping mummies, I swear). 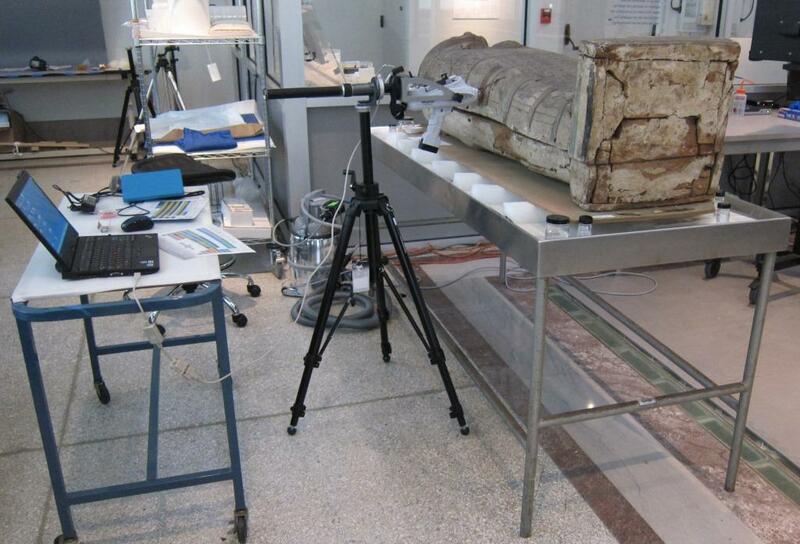 We have used the table on a daily basis, both for supporting mummies and large (people-sized) artifacts for treatment, and for prepping materials for re-housing artifacts. 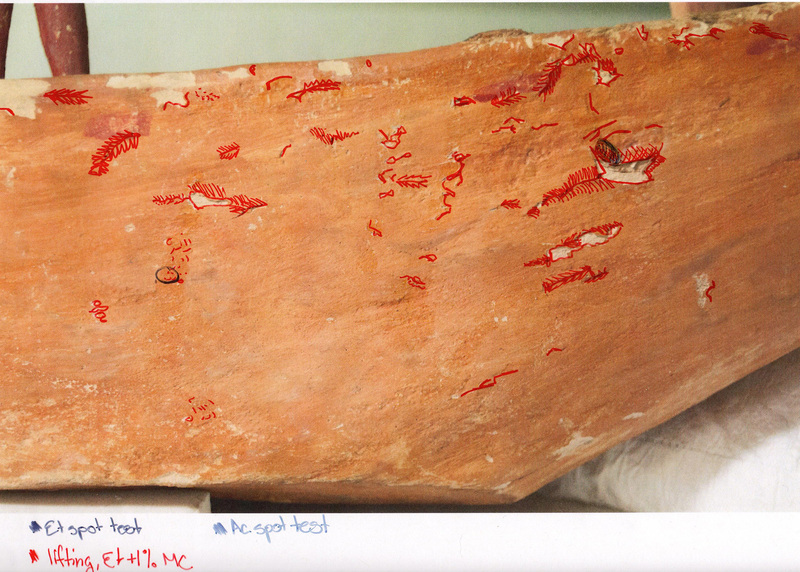 Tawahibre’s coffin on the autopsy table during pXRF analysis. Link to original post here. Unfortunately, it is not the most useful table, because it has a lip around the edge, the table surface is slightly inclined, and there is a hole on one end for the drain. But we made it work for us for over 4 years! The Artifact Lab has been closed to the public since December 31 and in the meantime we have been working away in here, but we are gearing up to reopen on April 8. When we reopen there will be some changes to both the lab space and the exhibition space. The most noticeable changes for visitors will be some new objects on exhibit, new graphics and text panels, and some other nice additions which I’ll write about in an upcoming post. 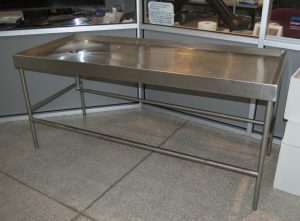 But the change that we are feeling slightly sad about is that we are getting rid of the autopsy table. It has served us well but it just isn’t functional for our purposes anymore. And since many of you may not have noticed the table before, I didn’t want it to go away without mentioning it here. We are hoping to find a good home for the table. Who might want an old autopsy table, you might ask? Well, this exists, so anything is possible. And actually, we can think of a lot of people who might like it. Stay tuned to hear more about the other changes to the Artifact Lab, and what we’ve been doing in the meantime. After using humidification and four extra hands, the mask is now unfolded! This complete view of the object provides us a wonderful opportunity to look at the materials used in construction and allowed treatment to finally move forward. Before jumping into treatment, I had the opportunity to perform Multispectral Imaging (MSI) on the mask, allowing us to analyze some of the pigments non-destructively and with great results. Under ultraviolet illumination, a bright pink fluorescence was visible (middle), indicating the use of a madder lake pigment in the cheeks and to accentuate the face and hands. 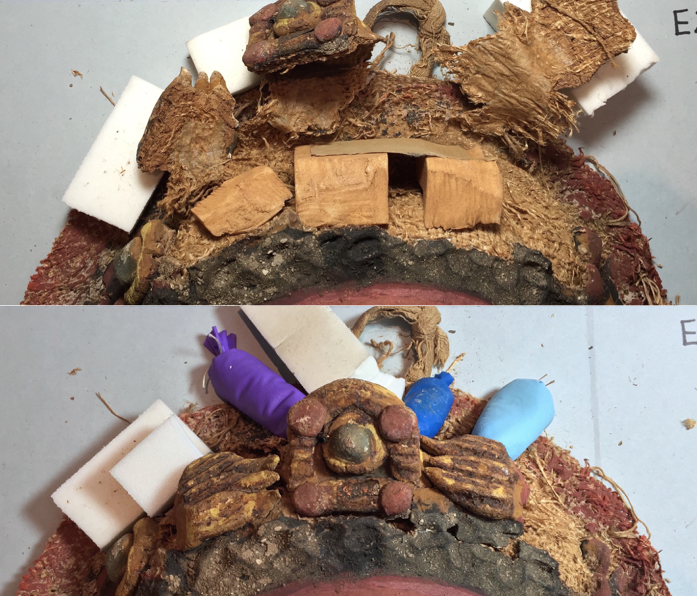 I also used visible induced IR luminescence to pinpoint the use of Egyptian Blue pigment in the crown, jewelry, and green leaves (right, Egyptian Blue highlighted in pink). This is a material commonly found in Roman period Egyptian artifacts. In addition to finding out some of the materials used, I also completed full documentation of the object. 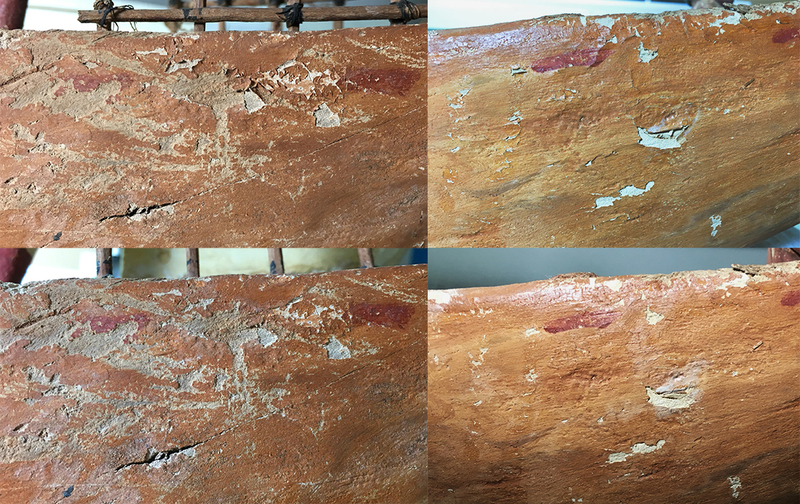 Although some of the surface is still intact, the paint layer is in poor condition with areas of flaking and powdering. There is also a large loss to the textile along with some smaller tears and holes. As my first order of business, the paint needed to be stabilized. This paint, like many other Egyptian painted surfaces, is sensitive to water and adhesives can cause staining and darkening. This meant a lot of testing was required to find the perfect adhesive for the job. Using both testing panels and small, discrete areas of the surface, I tested adhesives until I found funori, a seaweed-based polysaccharide. This material preserved the matte and light tones of both the paint and ground layers. As treatments usually go, you sometimes get unexpected bumps along the way. As I was consolidating I discovered that the flesh tones in the face and hands were significantly more sensitive to the water-based adhesive. I quickly had to rethink my approach, ultimately using a methyl cellulose in 50:50 ethanol: water for the hands, face, and larger flakes in the yellow framing the face. Once consolidation was complete, I moved on to the next hurdle: the molded mud plaster mask. 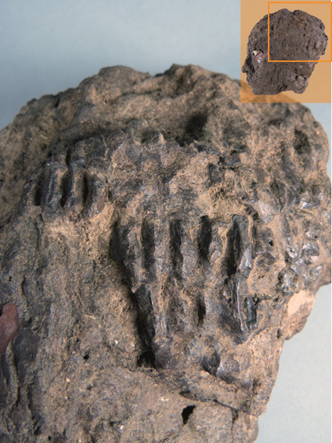 A large gap is present between the fragmented mud plaster crown and the textile below. To support the plaster and its mends, I made a removable fill of carved Volara foam and Japanese tissue, all toned with Golden acrylic paints to make the supports more discrete. Fragmented, actively shifting, and detached mud plaster was mended with a 40% AYAT in acetone applied by brush and syringe. Unstable and weightbearing cracks and gaps were filled with a 25% AYAT in acetone that was bulked with microballoons and toned with dry pigments. Fill material was applied with syringed, shaped with a brush and wooden skewer, and smoothed with a little bit of acetone. A thin toning layer of acrylic paint was applied to fills to make them a warmer tone, but still distinguishable from original material. And with that, the treatment is complete! The mask is now stable and will be returned to storage safe and sound. Amaris Sturm is a second-year graduate student in the Winterthur/ University of Delaware Program in Art Conservation. 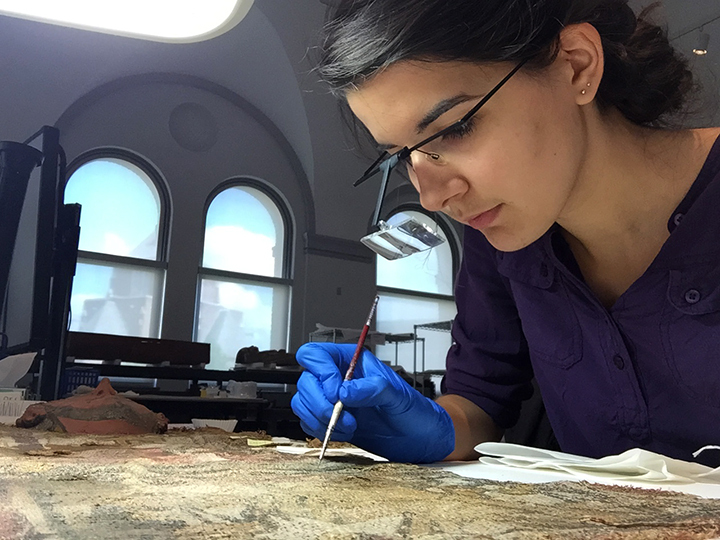 She recently completed her summer internship in the Penn Museum’s conservation labs. Amaris Sturm is a second-year graduate student in the Winterthur/ University of Delaware Program in Art Conservation. She is currently completing a summer internship in the Penn Museum’s conservation labs. I’m excited to introduce a new addition to the objects in the Artifact Lab! 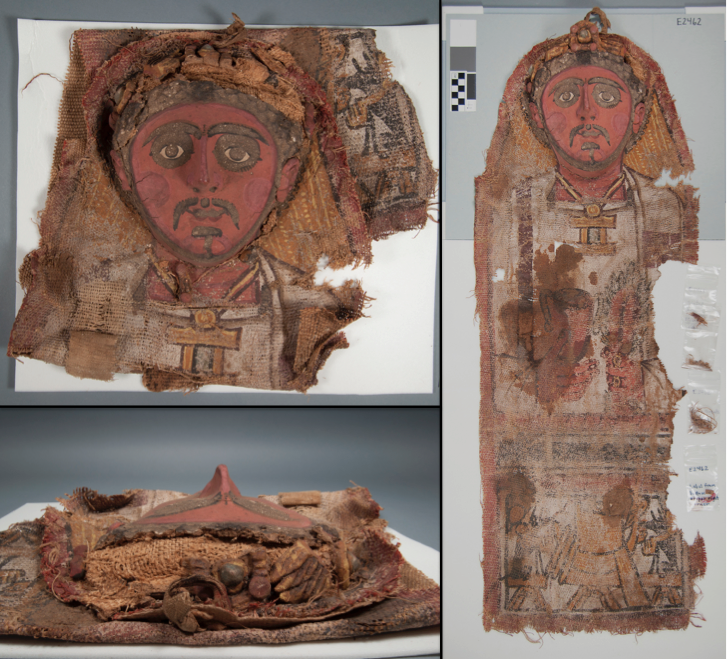 This Roman period Egyptian mummy mask and shroud, likely from 220 – 250 AD and excavated from Deir el-Bahri in the late 19th century, will be one of my primary treatment projects during my summer at the Penn Museum. 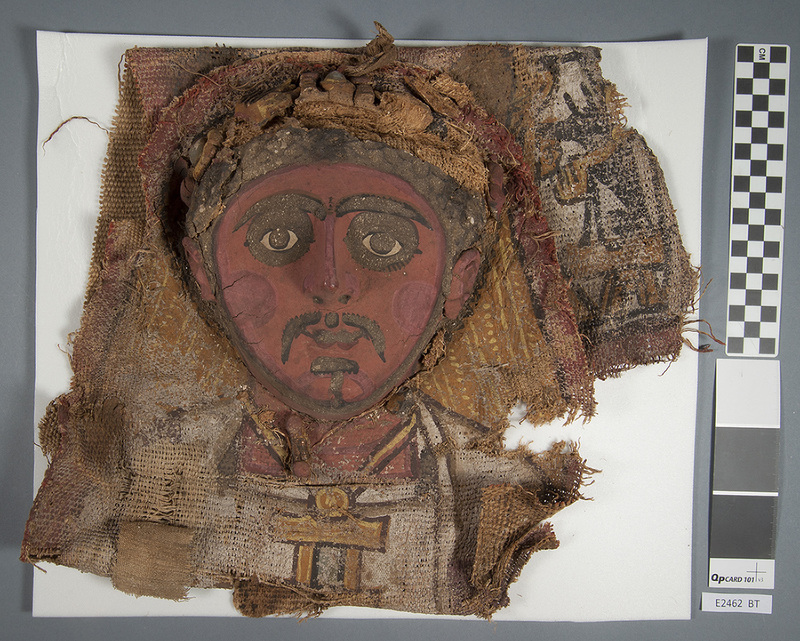 Meant to be placed over the upper body of a mummy, this mask is constructed of multiple pieces of coarsely woven linen sewn into a long shroud. At the top of the shroud is a hollow, molded mud plaster mask in the form of a man’s face with a jeweled crown. The entire front surface has a white ground with colorful painted decoration. Additionally, gilding is present on fragments of the crown. Sadly, the mask was folded at some point in its history, obscuring most of the linen shroud. 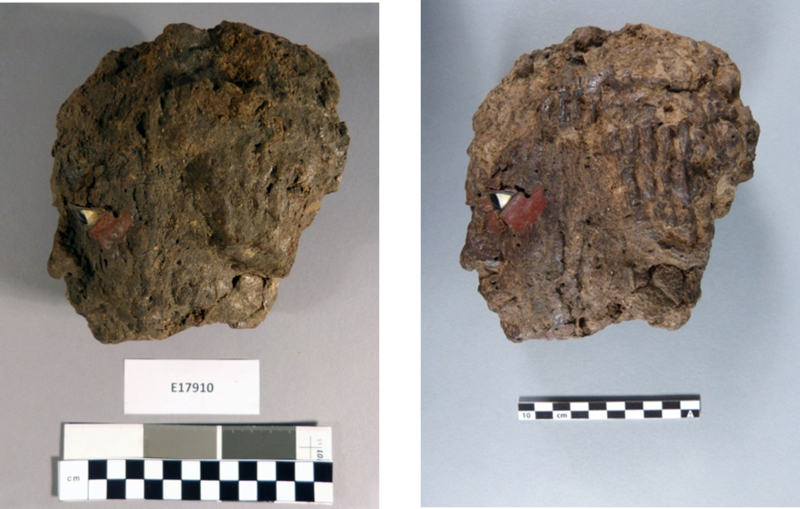 Although there are no records of the complete decorated surface and little is known about the history of the mask in our collection, other similar examples from Deir el-Bahri give great insight into what may be hidden beneath the folds. Comparable examples, including this mask from the Louvre, show the continuation of the man’s white tunic with a goblet in one hand and a plant stem in the other. A lower register is likely present containing Sokar, a falcon-headed god, on a boat and flanked by two jackals. One jackal is visible on an exposed corner of the Penn Museum’s mask. Apart from being folded, the mask has other condition issues that will be treated over the course of my summer internship. The textile support of the crown has sagged, causing the mud plaster to break and crumble. 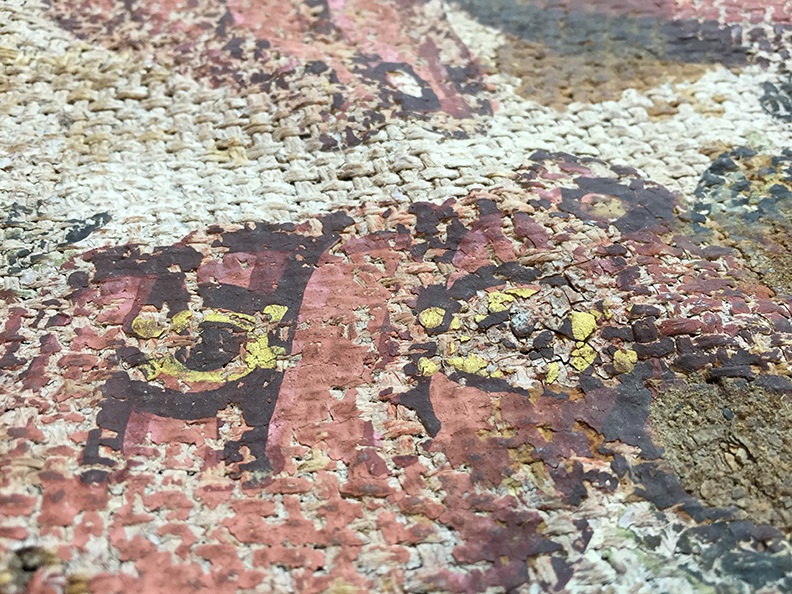 Additionally, the exposed painted surface is flaking and the linen fabric has started to tear and unravel. 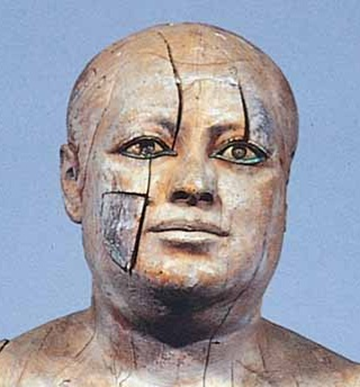 I hope to start treatment in this coming week and unfold the shroud, allowing us to better understand the construction, decoration, and condition of this mummy mask. Check back to see what it revealed and for more on the mask’s treatment! Riggs, C. 2000. Roman Period Mummy Masks from Deir el-Bahri. 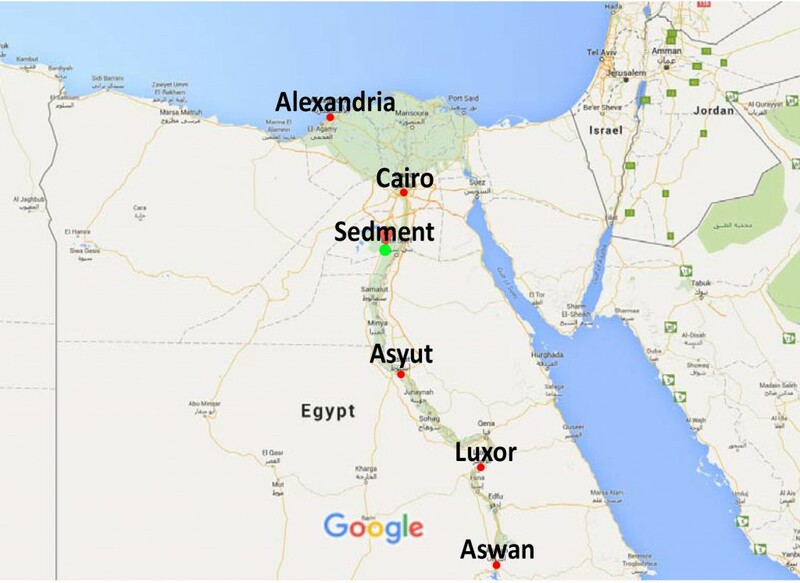 From The Journal of Egyptian Archaeology, 86. Egypt Exploration Society. 121-144. I apologize in advance for those of you who might be waiting for more updates on the Middle Kingdom boat model I started working on a while ago. That object was put aside temporarily to make room for all the pieces that recently came into the Artifact Lab when we deinstalled our Mummy Room and Secrets and Science galleries. While the cases in those galleries were reinforced to better withstand vibrations from the hospital construction next door, and new mounts designed and made for many of the objects, we were working hard to assess the condition of all the pieces, and treat them as necessary before the galleries reopened. This was a pretty short turn around, and several of us in the Conservation Department here chipped in to help make sure every object was looked at properly before they went back on display. While most of the objects are in good condition, and only needed a little surface cleaning to remove accumulated dust, some needed much more complicated and detailed treatments. I began by looking at our mummy Djed-Hapi, who is the first mummy you see when you enter the Secrets and Science gallery. Djed-Hapi, with his coffin lid and base (E3413A-C), in The Egyptian Mummy: Secrets and Science gallery. As you can see, In the original case design Djed-Hapi rests in his coffin base, while the lid is suspended above on a metal shelf. Unfortunately, the coffin lid will not be returning to the case, as the shelf it used to rest on cannot withstand the level of vibrations which may occur. Don’t worry though! It will remain in the Artifact Lab and be conserved as part of a future treatment project. Scan of an archival negative showing E3413B-C. He was x-rayed in 1980, and from these images we can tell that he was a man who lived into his 50s before he died. While these old x-ray images were serviceable, we decided to re-x-ray him in our digital x-ray suite here at the museum, because we felt we could get a better level of detail with the digital system. Djed-Hapi getting his x-rays taken in 2016 (left) and 1980 (right). 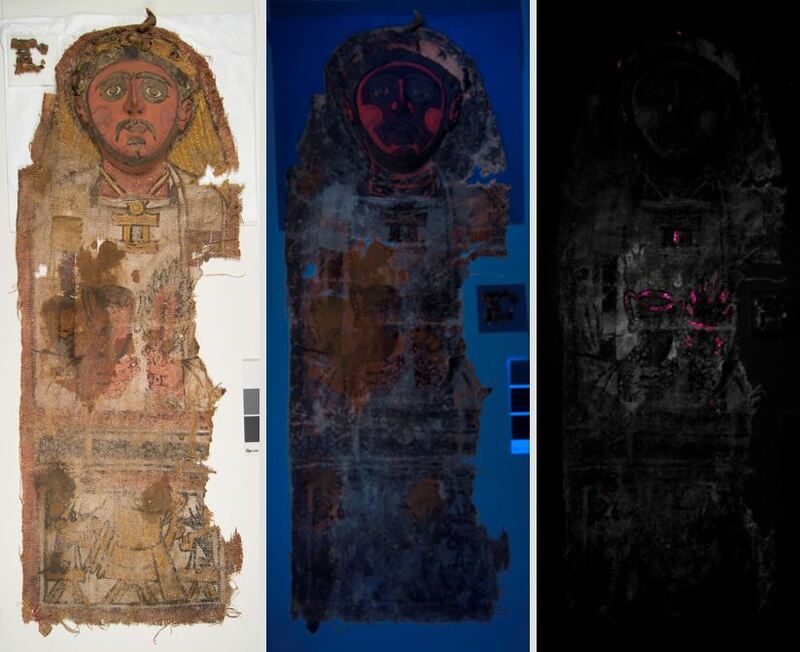 Study of these x-rays revealed some very interesting facts about Djed-Hapi’s mummification. His head is completely detached from his body, cleanly separated between two of the vertebrae in his neck. 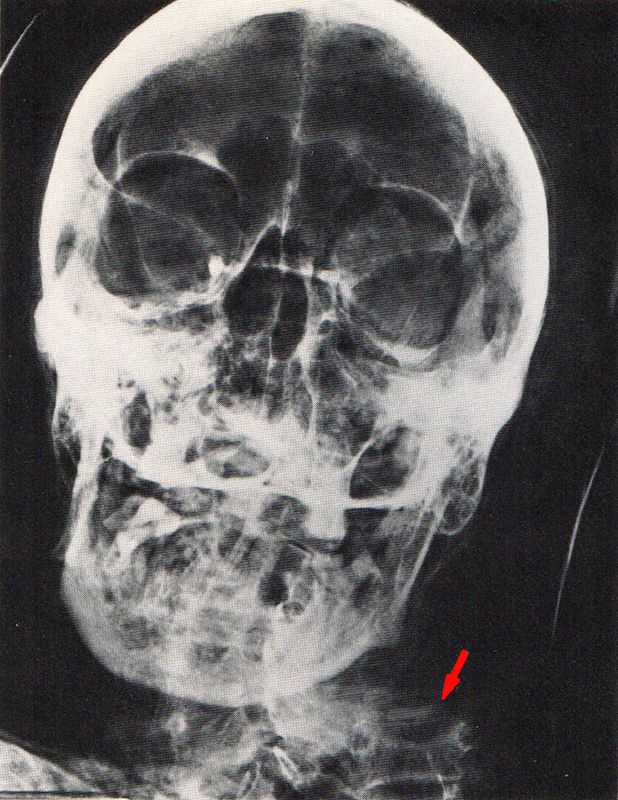 Detail of the 1980 x-radiograph of Djed-Hapi’s head. The red arrow shows where his spinal column stops. This was not his cause of death, but happened during mummification, and seems intentional. Starting in the Ptolemaic Period, the mummification process shifted from removing the deceased’s brain through the nose, to removing it through the base of the skull. 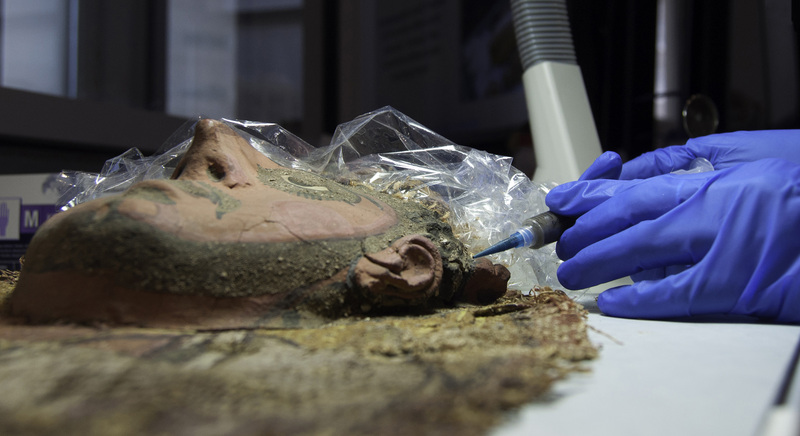 The x-rays also show that Djed-Hapi’s nasal cavity seems to be intact, so this change in the mummification process may be the reason Djed-Hapi’s head was removed, then replaced and carefully wrapped with the rest of the body. The decapitation is not visible from the exterior, and in fact his head and neck area are quite stable. The x-rays also reveal a bit about the condition of Djed-Hapi’s body underneath the wrappings. His skeleton is well-articulated (except for his head of course), including all his finger and toe bones, and you can even see the soft tissue preserved, which implies the body is in good condition. However, a closer look at his ankles shows that there is a rather large gap between the distal ends of his tibiae (shin bones) and his tarsals (ankle bones). While there is no evidence of damage to the exterior of the linens, we can tell whenever we have to move the mummy that the ankle area has some movement. This is an issue which could lead to further damage in the future, so careful handling is required. 2016 x-ray of Djed-Hapi, showing well-preserved soft tissue. The red rectangle highlights the gap between the bones in his ankles. 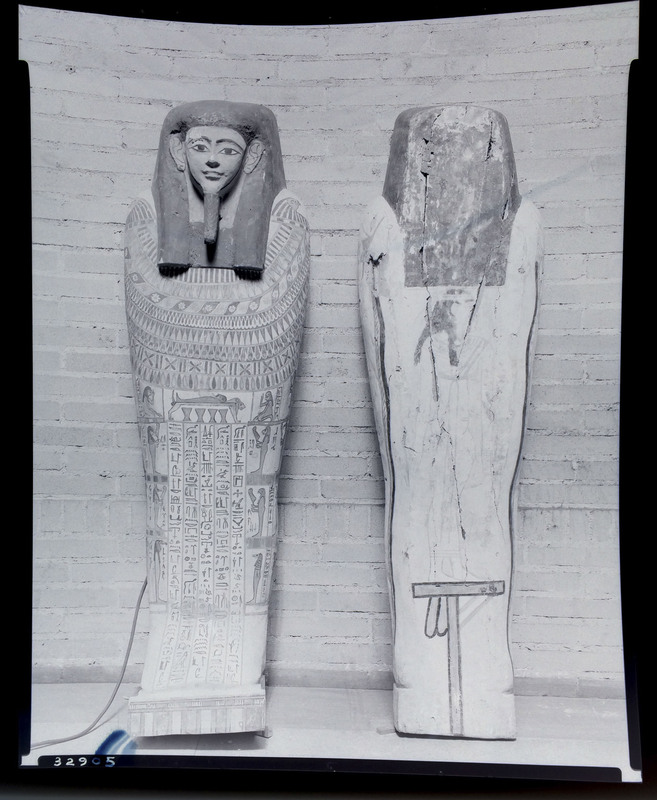 Next up, I’ll discuss the conservation treatment of Djed-Hapi’s mummy, and his coffin base. 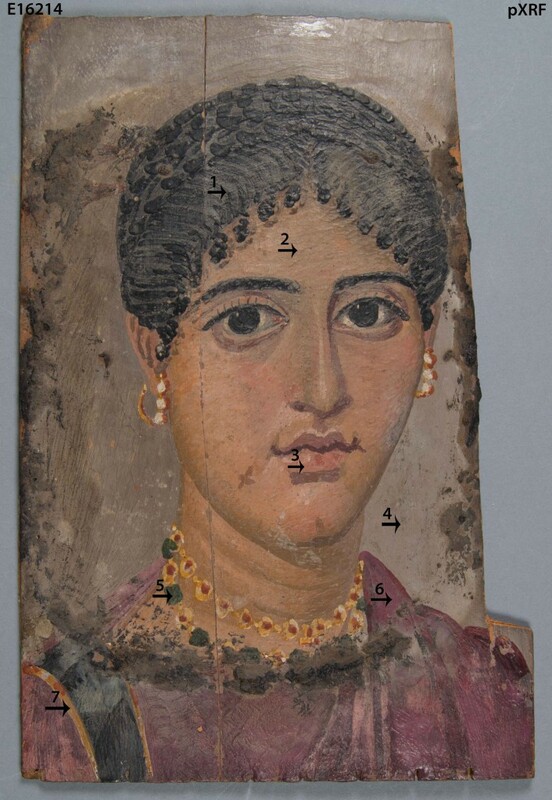 Alexis North is the Project Conservator for the Egyptian Storage Move Project, Penn Museum. Fleming, S. (1980). 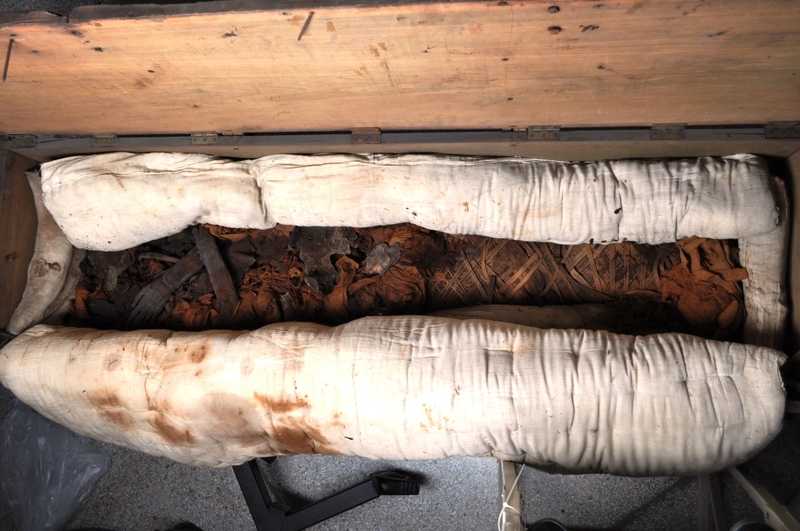 The Egyptian mummy: Secrets and science. University of Pennsylvania. Since my first post, I have been working steadily on stabilizing the painted wooden boat model. For a bit more background, this boat model was excavated from Sedment, a cemetery site about 100km south of Cairo. Several wooden models were also removed from Khentkhety’s tomb, including two boats, a granary, and several human figures. The boat model I am currently treating, which represents a sailing boat, was found on the ground outside the burial chamber, where it had been either moved or dropped by the tomb robbers. To return to the present day, the first and most obvious issue which needed to be addressed for this model was the actively lifting and flaking paint. In order to determine the best materials and procedure to follow, I and some of my fellow conservators performed spot tests with water, solvents, and adhesives. This involves applying a very small amount of each material to an inconspicuous area of the object to be treated, and watching for any reaction, like darkening or staining. Luckily, the surface of the boat model did not react negatively to any of the materials tested, and I was able to move on to treatment. Before (top) and after (bottom) consolidating the areas of lifting paint. I am also keeping a detailed record of where I am applying the consolidant. 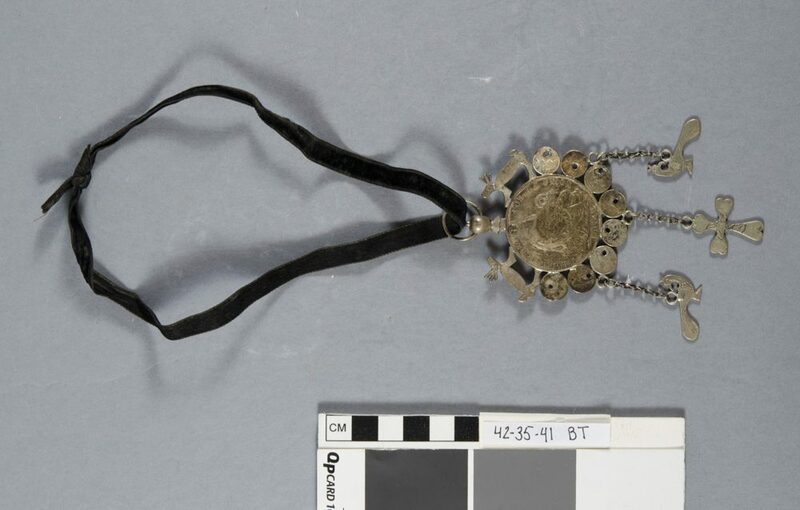 Documentation is an important part of conservation treatment, so future examiners know what is original and what has been added to the object over time. These records can also alert a conservator to any additional changes in the object’s condition. An annotated image showing all the spots I consolidated, what material I used, and where I performed spot tests. In working closely on the exterior surface, I have seen several areas where it appears a resin or surface coating was applied. 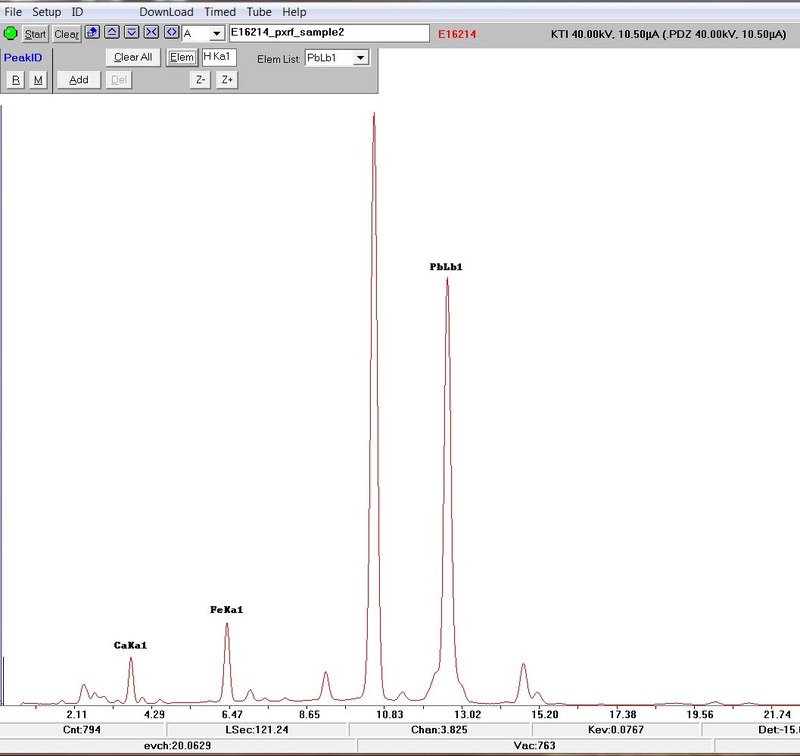 I do not know right now whether this is ancient or modern material, but that is something we may be able to find out in the future using different analytical techniques. What I can see now is that these areas show preferential damage, where the applied material has shrunk and become brittle, pulling the paint away from the wood beneath it. Image of the bottom of the back of the boat. The green areas indicate where the applied resin has run down the bottom, and there is now preferential loss to the paint in those areas. If the material is modern, I may decide to try and remove it before it can cause further paint loss. If it is an ancient application, however, we want to preserve it as part of the object’s construction. The areas will be documented carefully, and monitored for future changes. I have now finished the sides of the boat, and am moving on to the top, where some of the most significant flaking is. I will be back with another post soon to show the progress! Horne, Lee. Introduction to the Collections of the University Museum. Philadelphia: University Museum, University of Pennsylvania, 1985. Petrie, W.M.F. and Brunton, G. Sedment. British School of Archaeology in Egypt Publications, v.34/35, 1924. We still haven’t gotten to the bottom of the question of whether our mummy Wilfred is indeed Wilfred or is instead Wilfreda, because there have been a few things to take care of first. In the meantime, I am referring to the mummy as Wilfred/a. Hopefully this person would not be offended by the ambiguity, but we hope to clear this up soon by x-raying the mummy using our new digital x-ray system. Before we can do this, I have been working to stabilize the remains enough to allow them to be moved safely down to our x-ray room. In the process of stabilizing the remains, I have made some observations. The exposed remains on the upper part of the body, while very fragile and disarticulated, are remarkably well-preserved in areas. 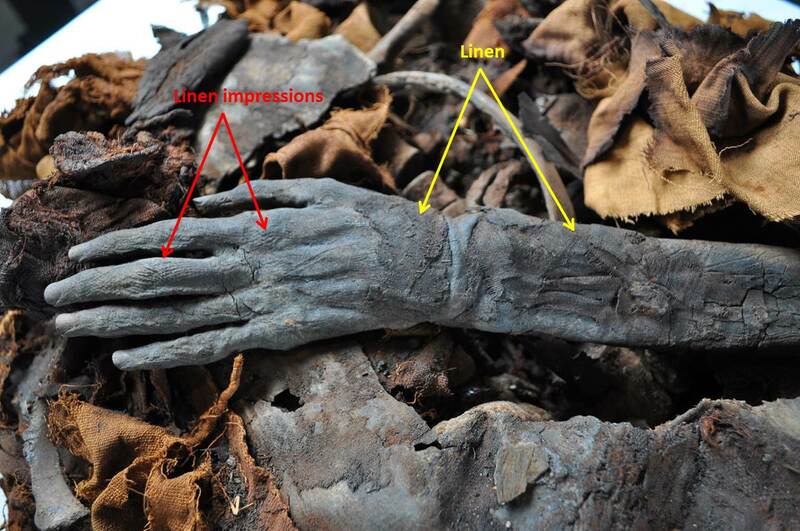 The preservation of the hands and arms is particularly notable – the fingernails are intact on the left hand, and it is clear that the arms and hands were wrapped separately with linen as part of the mummification process, due to the presence of linen and impressions of linen on the skin. A detail of the left hand and arm. 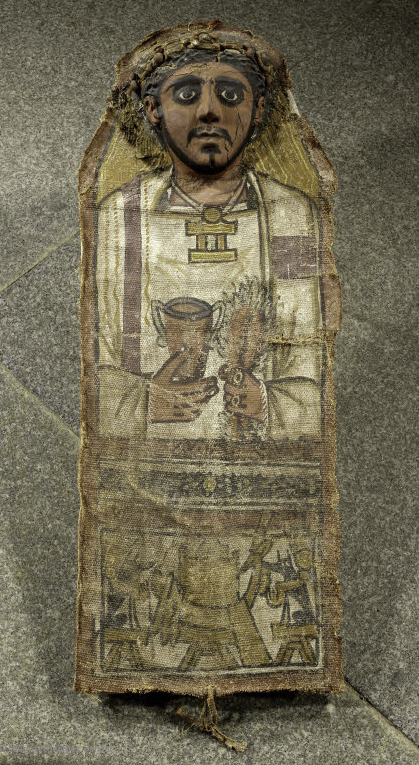 Note the presence of fingernails, and the linen and linen impressions, marked on the photo with yellow and red arrows. Unfortunately, we can also see that there has been damage to the right hand since the 1932 x-rays were taken (Wilfred/a, along with many other mummies in our collection, was x-rayed in 1932 by Dr. J.G. Cohen at the Graduate Hospital). In the old radiograph, it is evident that on the right hand, the thumb is intact, and at least most of the hand and fingers are also intact (the hand is partially cut off on the image). Today, we’re missing the thumb, all of the fingers, and part of the hand – only 3 of the metacarpal bones remain. Left image: 1932 radiograph, showing arms crossed and right hand intact. Right image: 2015 photograph, showing damage to right hand. In my examination of the remains, I did not locate any detached elements from the right hand, but it doesn’t meant that they’re not in there somewhere! We may locate them once we x-ray the remains again. Also of note is that the arms are crossed over the chest, right over left. From what I have read, the crossed arm position is generally not seen until the New Kingdom, when it is reserved for royalty, until about 600 BCE or later. 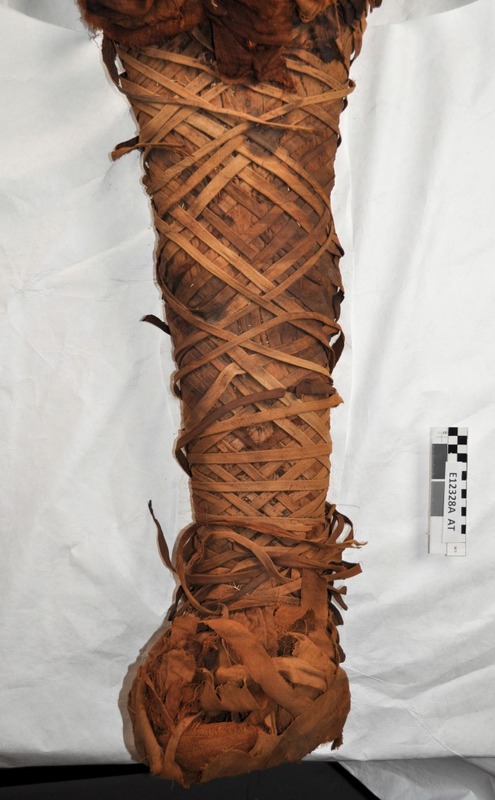 We think that Wilfred/a dates to the Ptolemaic or Roman period, based on the style of the intact wrappings around the legs. Wilfred/a’s wrappings are intact from the pelvis down, with narrow strips of linen creating an elaborate rhomboid pattern. Because Wilfred/a likely dates to this Graeco/Roman period, the arms crossed over the chest do not indicate royalty, necessarily, and may have been to emulate the pose of Osiris. Once these observations were documented, I started in on the treatment. Since there are no immediate plans to exhibit Wilfred/a’s remains, I took some measures to stabilize them for the move down to the x-ray room and for eventual return to storage. 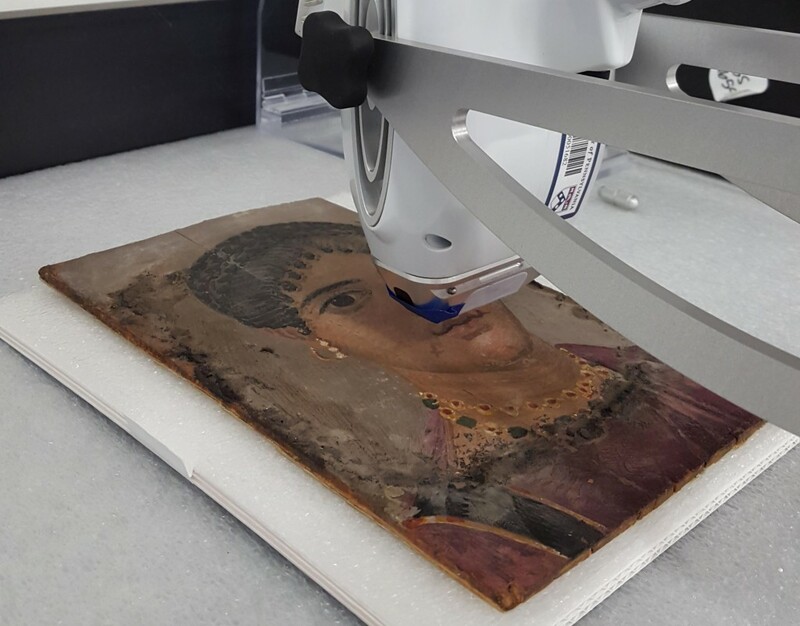 If we ever do decide to exhibit them, the conservation work to prepare them for display will be much more straightforward now that some of the initial work has been carried out. After removing Wilfred/a from the mattress (with a little help from my colleagues), I carefully removed all fully detached material and bagged it according to material type. I lightly cleaned the surface of the exposed arms and the intact wrappings on the legs and feet, recovering some insect remains and remnants of old packing materials (like cotton and wood shavings) in the process. I then wrapped the mummy in Tyvek and bolstered the sides of the chest area with pillows made from Tyvek and polyester batting. Wilfred/a is now ready to move onto a rigid support, which we plan to make from archival honeycomb board specially purchased for this project. Wilfred/a, pictured here after treatment, is now almost ready to be moved down to our x-ray room. 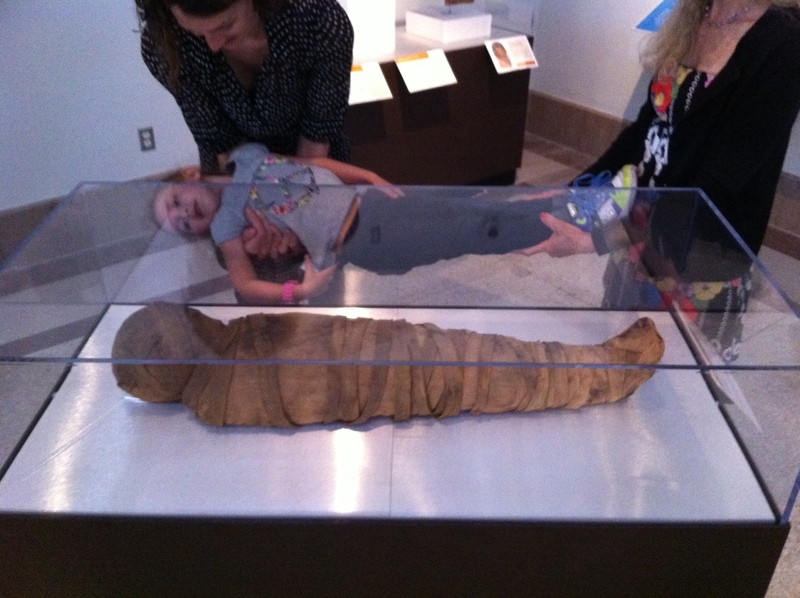 Everyone loves Tanwa, our child mummy, but a lot of people ask about her size. “Isn’t she kind of small for a 5-year-old?” they’ll ask. Without knowing a whole lot of 5-year-olds myself, I usually say, yes, I guess, but you have to remember that she’s wrapped really tightly and that people were generally smaller in stature 2000 years ago. We also don’t know how she died, so theoretically, her size could have been affected by a disease or something that eventually caused her to die. But the truth is, I don’t know how she compares to the size of kids today. But today I had the perfect opportunity to size her up, and a willing subject, my niece Luisa. Luisa is “almost 4-years-old” (this is a direct quote). We held Luisa up next to Tanwa for a little height comparison. Luisa is the tallest in her class and she’s “almost four”, and she’s just about the same height as Tanwa. So I would say that Tanwa isn’t so short after all. What do you think? What is under the paraffin ? Quite a while ago, we dealt with the treatment chosen for the two Egyptian wooden heads and now it’s time to talk about its results. Let’s focus on the cleaning of the surface: the goal was to remove the paraffin that certainly masked other remains of the painted layer. First of all, we have to talk about the notion of original surface and original level. > The original surface is composed of the original materials, before they were buried and underwent an alteration process. 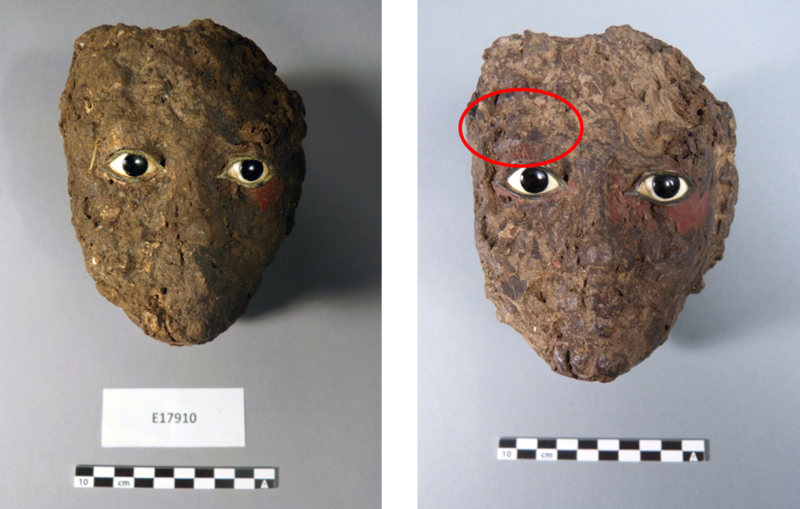 Concerning the heads, it corresponds to the paint layer they were decorated with. > The original level is a layer of altered material that took the place of the original material but remained at the same level as the original surface. A good way to understand this is to think about a fossil: it is no longer the original animal, insect or plant made of flesh, bones, shell that it used to be…but you can still identify its shape since it was precisely petrified by another material. That’s what we can call the original level of an object surface. It was necessary to define what the original level was on the heads, so as to know how deep the cleaning could go. It had to keep its meaning regarding the object itself. The paint layer was a good clue since these colored patches were all that remained from the original surface. As far as we could see, the rest of the surface was more or less corresponding to the original level. Indeed, there was no important gap between the painted areas and the present surface. Original surface and original level near the wig of E17911, x7.5 magnification. Another issue with paraffin was to think about how much of it we wanted to remove. Indeed, this sticky layer seemed to be what was holding the elements of the current surface together. That was especially true about the painted areas. 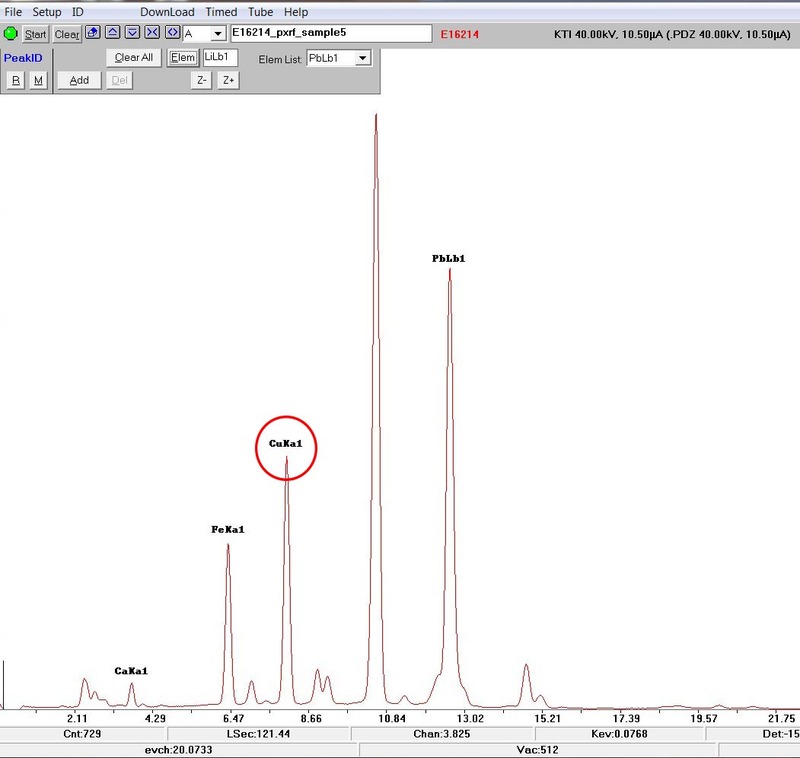 Concerning the wood, we could only suppose that the paraffin had penetrated inside on a few millimeters only (thanks to a few articles that were published and gave estimations of paraffin migration inside archaeological wood) since we had no way to obtain an accurate estimation of this. Therefore, we didn’t want to remove it completely from the wood because it could threaten its stability and cause the wood to crumble. Pictures of E17910’s chin before and after cleaning, x7.5 magnification. E17910’s right eye, before and after cleaning. Then began the exploration of the unknown side of the heads, meaning the rest of the surface, where the presence of areas of paint was only a supposition. This part of the work was really the longest since we couldn’t know what to expect under the paraffin and sediment layer. Some days, only a centimeter square could be cleaned ! Cleaning was carried out using a binocular microscope, in order to see precisely what happened under the scalpel blade and to be able to stop whenever it was necessary. We found some new paint areas, generally rather small, sometimes buried under a rather important depth of sediment. Example of two new painted areas on E17911, on the wig (on the left) and next to the right ear (on the right). E17910 before and after treatment: a wig is now visible. Close-up on the wig on the right part of E17910. E17910’s face before and after, with other remains of a wig. The cleaning allowed us to reveal a wig on the right side of E17910 and some other elements belonging to it on the face. We now know more details about the heads and they are almost able to be studied. See you at our next post to learn more about the remaining steps of this treatment.